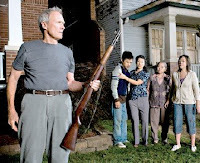 At first glance, Gran Torino might seem like another one of those white men saves the day kind of stories that spew out of Hollywood on a regular basis. But it's not. It's a movie about how crossing borders to encounter the personal and particular, as Hazel Rochman put it, can "save" the racist in all of us. Clint Eastwood liked the script by Nick Schenk, a rookie screenwriter based in Minnesota, so much that he didn't allow a single word to be changed. Schenk credits the friendships he made while on the job, both with war veterans and Hmong factory workers, as inspiration for the story he wrote with his brother's buddy Dave Johannson. How did the brown people portrayed in the film view this story by a white writer? Asian Week covered the Hmong community's reaction to the film. The general response of Hmong moviegoers has been positive, and (but?) eastwoodmovie-hmong.com, a blog that was critical of the movie, has disappeared. Two Hmong-American guys, Cedric N. Lee and Mark D. Lee filmed, directed, and produced a documentary about the making of the blockbuster. It's called Gran Torino: Next Door? and is available only on the June 9, 2009 Blu-ray disc release of the Eastwood movie. Here's the preview of Gran Torino, which I recommend as a must-see for those of us who cross borders in our storytelling. Who saves whom, and how, and why?